Linda Prinster is a 47-year old mother of eight, who was described by a doctor as "extremely metabolically resistant." Prior to founding Pounds and Inches Away (an HCG diet consulting firm which utilizes the HCG Protocol for weight loss), she tried many popular weight loss programs. She also owned an exercise studio. Like most lifetime dieters, she gained and lostthe same 20 pounds over the years. After participating in the HCG Protocol herself, she lost 25 pounds, but more importantly has kept the weight off for more than 3 years. She is now wearing size 8 jeans for the first time in her life. Prinster is the author of the HCG Weight Loss Cure Guide and co-author of Pocket Guide to the HCG Protocol, the 101 Worry Free HCG Diet Recipes Book, and the Over 201 Worry Free HCG Maintenance Recipes Book. She holds a PMP certification, and has significant consulting experience in management, research/documentation, and weight loss. Linda is the founder of Pounds and Inches Away Inc., which also offers franchises, and co-founder of other HCG related companies. 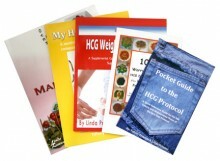 Her companies have assisted thousands of clients in successfully completing the HCG Diet Protocol. Linda and her husband, Gary, of 25 years, and the father of all the children, reside in O'Fallon, Missouri.